Baby Driver, the 5th theatrical film by beloved British fanboy-filmmaker Edgar Wright of The Cornetto Trilogy and Scott Pilgrim fame, is a charming though at times slightly bland film, in which many of its theoretically unique quirks have actually not only been done, but done better by other films that were released in recent memory. Telling the story of Baby (Ansel Elgort), a getaway driver in a criminal outfit ran by his pseudo-mentor/friend/boss/captor(?) Doc (Kevin Spacey) who wants to escape the life of crime with dreamy waitress Debora (Lily Collins). What follows is an at times pulse raising action comedy thriller filled with car chases, tough guy dialogue and frightening gangsters as our lovers race against the odds to get away from it all. So surely there’s something else to this, right? Well, yes and no. Despite the disastrous advertising campaign that truly muddles what the film’s actually like, the film is very clearly something different right from the beginning. It’s, dare I say it, a musical? But it’s not. The film’s full of music, and can be confusingly referred to as ‘musical’ yet it’s absolutely not a musical. Rather, instead of our characters leaping out of their cars and engaging in a highly choreographed sing-along, instead it’s the film itself that does all the performing. Long time fans of Wright will know that he has a very distinctive madcap editing style that brings a lot of his film’s comedy to life, and here it’s used similarly. The in-universe explanation for this musical extravaganza is Baby. See, he suffers from an acute form of tinnitus, causing him to have a crippling ring in his ear. To live with it, he’s constantly sporting an iPod and headphones, with which he drowns it out to the soundtrack of every song I presume Wright loved growing up. As a result, the world around him shifts into a fantastic world punctuated/edited to the beat of the music, creating a form of naturalistic musical that we don’t see too often. But a lot of the issues for me stem from the fact that Baby Driver is out in a year that recently saw the UK release of La La Land as well as John Wick: Chapter 2, where some of the more distinct traits of the film feel less than stellar in comparison. However, when viewed on its own, Baby Driver is fun enough, boasting a variety of strong performances that bring life to a somewhat bland script. 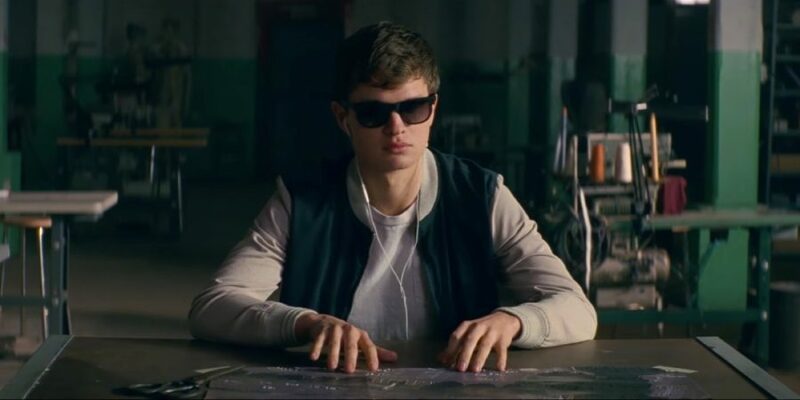 Perhaps the most surprising part of Baby Driver is how unfunny it is, which comes as a tremendous change to Wright’s usual style. Overall, however, you can’t go wrong with a bit of car-action and interesting characters, so for that reason it’s recommended you go and see it. The posters bill the film as ‘This Summer’s Coolest Movie’ which should be sufficient enough to get audiences in, because outside of being cool, the film doesn’t have much else happening in it. Also, as always, as an original studio produced film (directed by a Brit at that) it’s important to foster these ideas, so it’s a worth a look for that reason alone. Tagged baby driver, film review, kit ramsay. Bookmark the permalink.